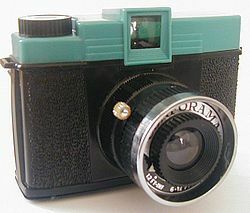 The Diana camera is a plastic-bodied box camera using 120 rollfilm and 35 mm film. The camera has a simple plastic meniscus lens. Originally marketed as an inexpensive novelty gift item, the Diana has been used to specifically take soft focus, impressionistic photographs somewhat reminiscent of the Pictorialist Period of artistic photography, but using contemporary themes and concepts, known as lomography. The Diana frequently suffers from light leaks, film advance issues, and other problems. However, its low-quality plastic lens has been celebrated for its artistic effects in photographs, normally resulting in a slightly blurred composition that can provide a 'dreamlike' quality to the print. I was re-introduced to what is now called lomography by my son Clayton. He worked at Urban Outfitters which carried the Lomo brand of Dianas. When he came home with a Diana kit, I rummaged around and found my old camera. Since then I have taken a number of images. Some of these are linked below.